It was time to replace the toilet seat, which is generally considered as easy job. Well, the bolts holding it on were about two inches longer than they needed to be and totally rusted. The “nuts” were plastic that deformed when the needed pressure to twist them off were applied, and there was only room for about 1/4 turn at a time since the socket wouldn’t fit over the long bolt. Hello Sawz-all! But that’s not what we are writing about today – it’s the self closing lid. Imagine – no more complaints about the lid left up, no more clanging of the lid as it is dropped down – seemed like a great idea until you thought about it more. In practice, here’s what happens. 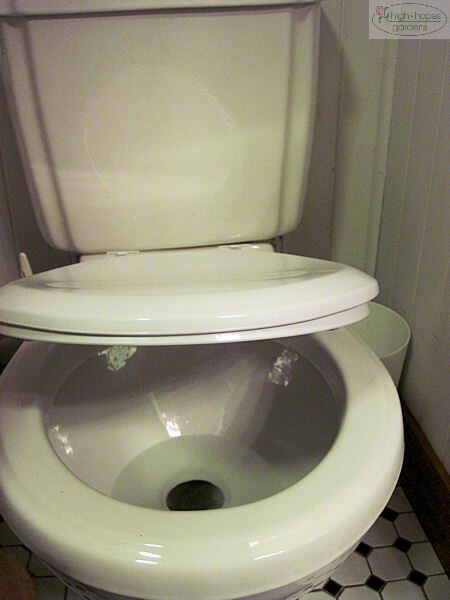 If you’re male, you might start a steady stream and watch in horror as the seat and lid slowly drop, midstream so to speak. Not much better if you are a woman – you sit down and the lid drops on and starts pushing on your back as you try to relax. Back to the traditional manual toilet seat. 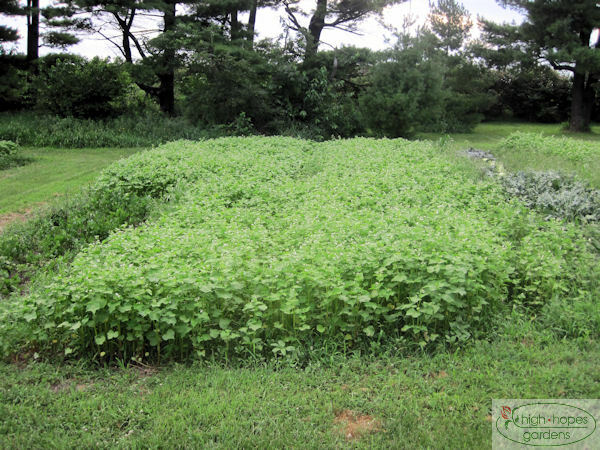 A great way to rescue a garden from late-season weeds is to plant buckwheat. 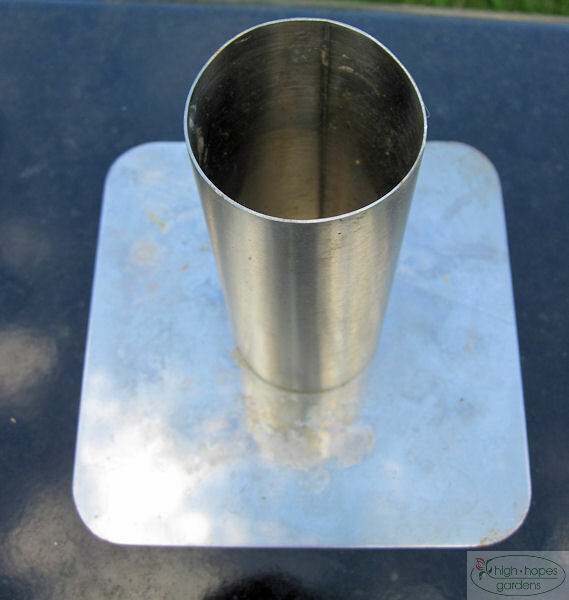 It establishes quickly and does a great job of smothering weeds. It also adds some nice bee forage. 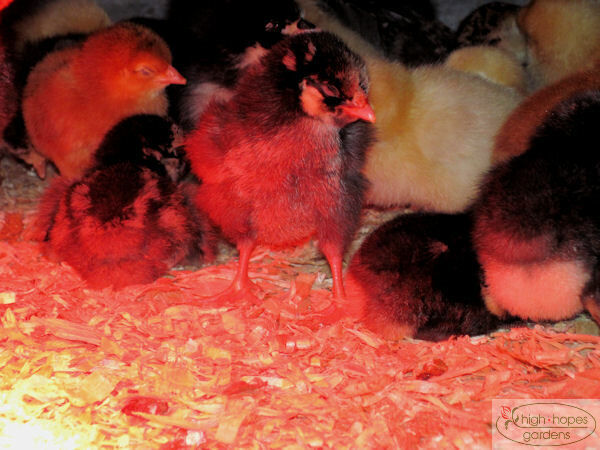 New laying chicks came today. These ladies will be in full production next spring. We’ve got some hens three years old and a handful have learned bad habits, so this fall, we’ll get out supply of stewing hens for winter-time chicken soup. The turkeys this year turned out badly. The message is that we can’t leave the farm this month. Of course, we lost Tank on the vacation to Minnesota, and a one-night getaway last weekend, the farm watcher dis chores in the evening, and in the morning 17 of the turkeys were dead. It was a hot day. 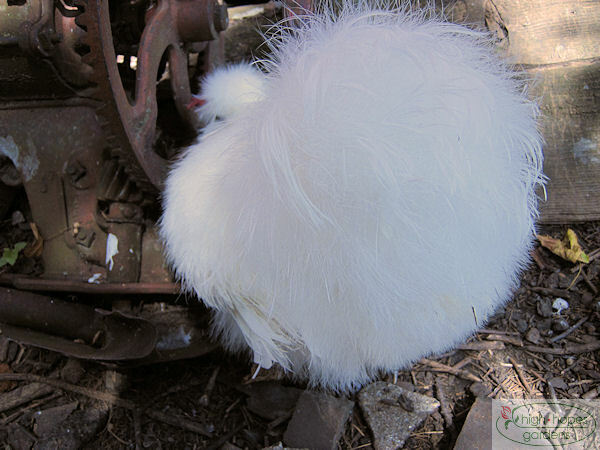 They were not smothered in a pile, nor were they at the extremities of the brooder, nor did they have visible marks or bites. The only thing out of the ordinary (but not this year) was a big lighting storm. At any rate it is a bit disheartening to lose them – both for the price at $5 per poult and the lack of turkey at Thanksgiving. Get ready allergy sufferers, ragweed season will soon start! 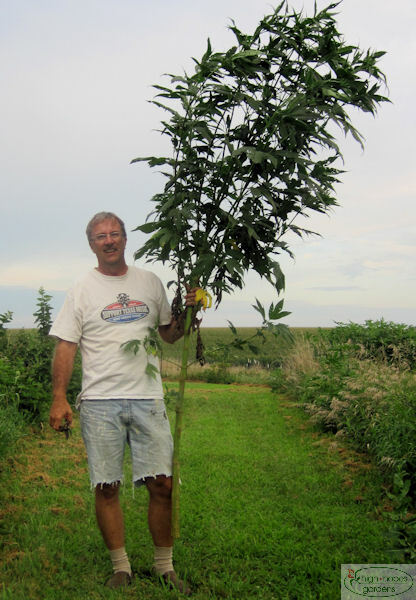 They don’t call it giant ragweed for nothin! One of the disadvantages of outsourcing the mowing to Emma is that I don’t always get around to all corners of the farm. This beauty popped up along a fence line where I cut down a mulberry tree last year. I feel rather powerless and inadequate in broaching this subject to you. Who am I to complain or nag about the weather? That being said, your power is unrivaled. In some regions of the country (except San Diego where the weather is usually the same from day to day) nearly every conversation begins with talk about you. Every day a portion of the nightly news is devoted to you. So, please do not take offense at my humble entreaty. Between me and you – the rain needs to moderate. Really, enough already. In this neck of the woods, we get it. You win. Knocking out a major city’s water supply and flooding downtown Des Moines, along with filling Hilton Coliseum in Ames with water in 1993 was an attention getter. In 2008, you took out Cedar Rapids and did your best in Iowa City. Just last week, you took out a dam on the Maquoketa River. Heck, for the first time on the ride home from Minnesota, there was a road detour on a detour. Many people have traditionally danced for you to bring rain. I’m not sure what the ritual or program is to ask the the rain not to stop, but to stop the excess. I’ll wait for inspiration. Heck, maybe a blog entry will be all it takes to appease you. 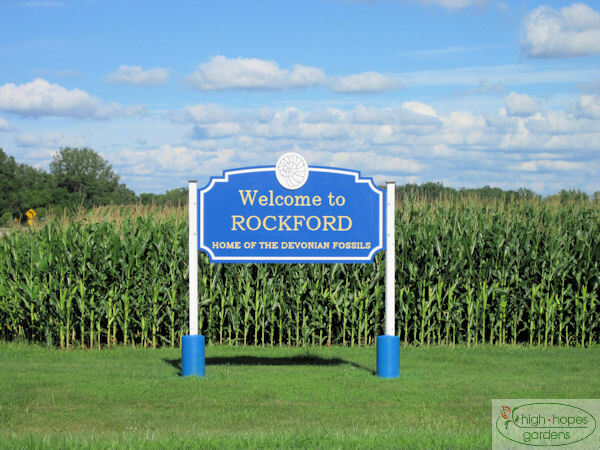 July 25, 2010 – A Quiet Day in the Country? Today we might just as well have lived on the approach to ORD, DEN, or MSP. Early Sunday morning, the crop dusters started buzzing, sometimes two at a time, it seemed for most of the otherwise quiet and calm Sunday morning and afternoon. 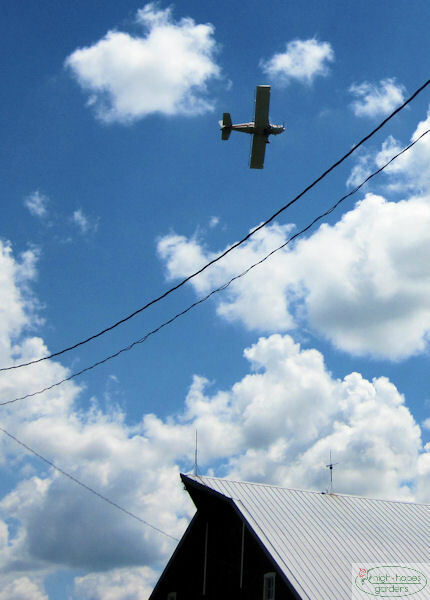 In the city, FAA regulations don’t allow planes to fly this close to residential properties and structures. And of course, it just isn’t one fly-by, but repeated twists, turns, and approaches. I was happy when the droning and buzzing finished for the day. There are some places that are so incongruous. 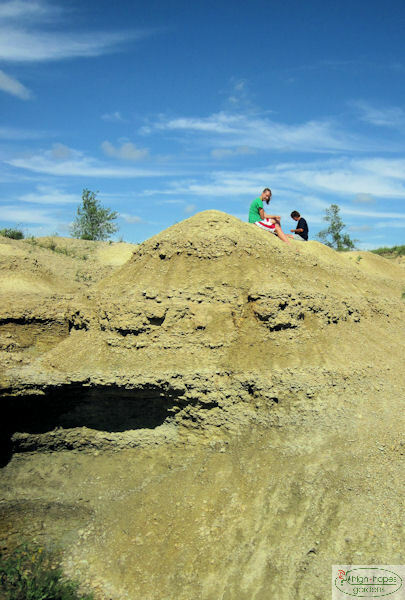 The Rockford Fossil Quarry in north central Iowa is just such a place. 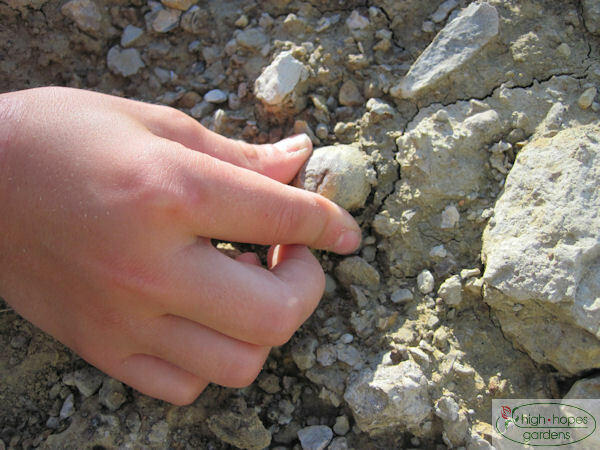 It is only one of three public fossil collecting sites in the nation. 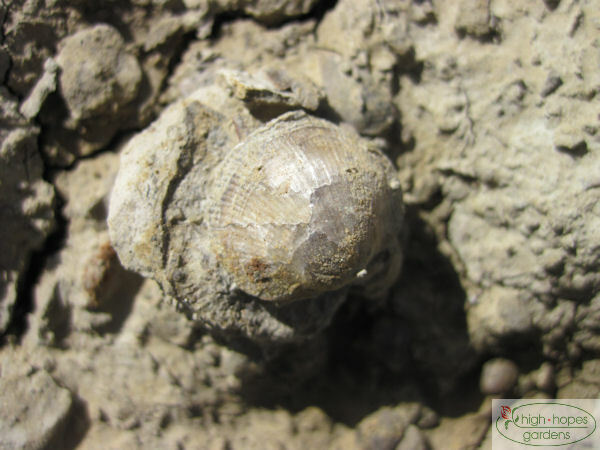 Here’s a fine example of the kinds of fossils you can easily find. The landscape has a decidedly western feel to it – something you’d expect to see in South Dakota or Wyoming, not surrounded by corn fields. Martin readies to pluck a 370 million year old fossil exposed to the light for the first time in a LONG time! 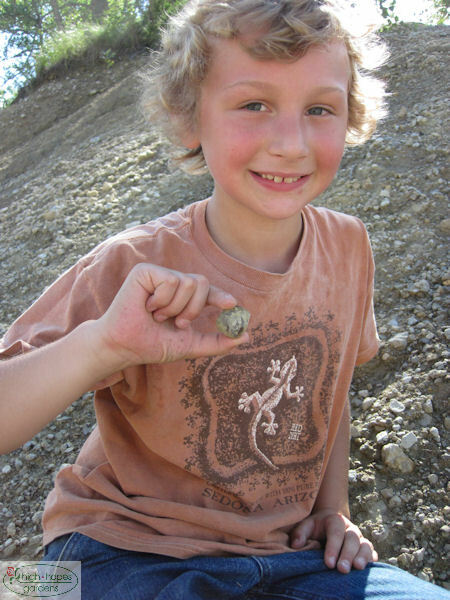 Martin showing off one of his finds. 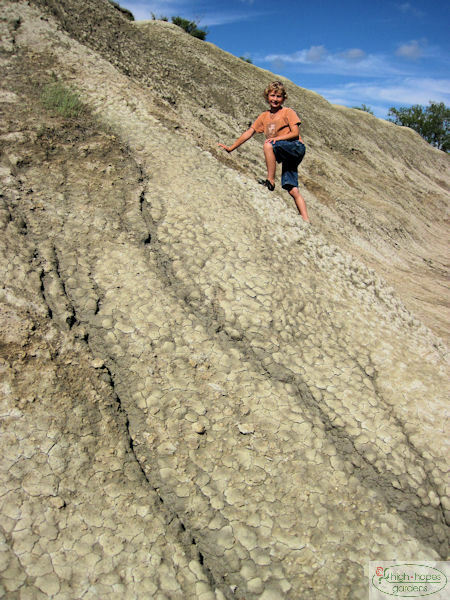 Again, Linda and Emma collecting on a Badlands-looking outcrop. 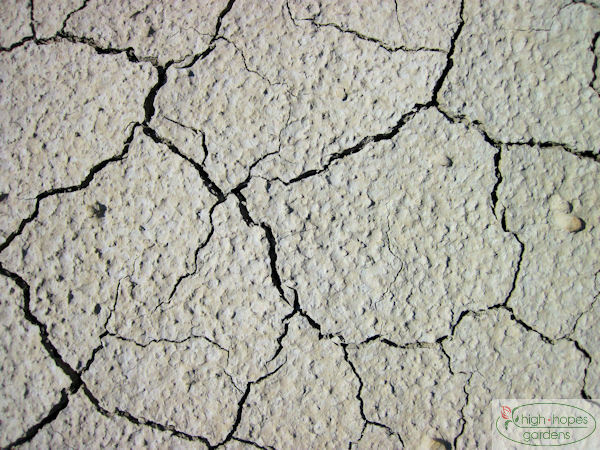 Mud cracks – nothing screams the desert west more than these! 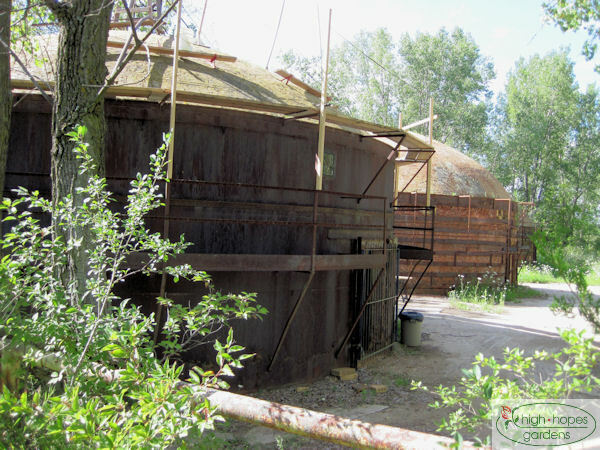 The quarry was originally home to these beehive kilns that were used to make bricks. 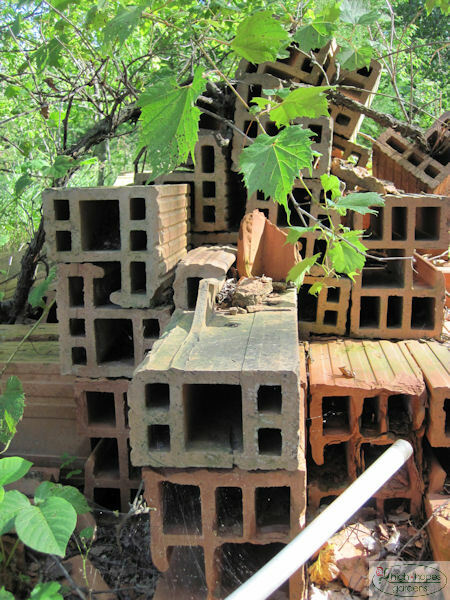 A waste pile of bricks leftover from when the kilns shut down. I think they’ve got a bit of an artistic look to them, much like Tiffany glass patterns popular in Frank Lloyd Wright homes. The carrots in 55 gallon drum experiment is over for this year. 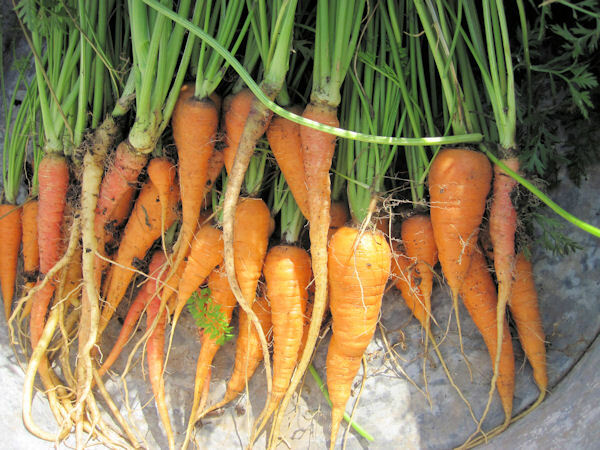 Although the carrots weren’t as plentiful and large as I expected, I take the blame for that since I had poor germination and didn’t replant, and probably pulled them too early as some were strangely flowering (carrots are biannual). They were frozen for chicken soup. I followed them with some kohlrabi. We’ll try again next year! Here’s this week’s thingamajig Thursday. I’ve received feedback from more than one person that the “hold your cursor” instructions weren’t working – so now the answer will be in the comments after a week has passed. 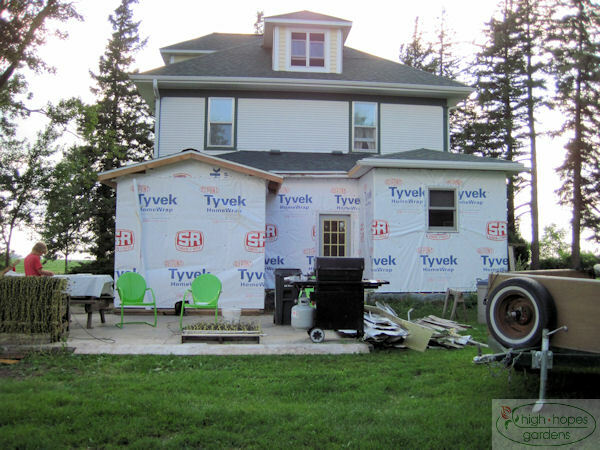 To me, it already looks better, as long as we can avoid the red-neck house wrapped in tyvek for 2-3 years look! 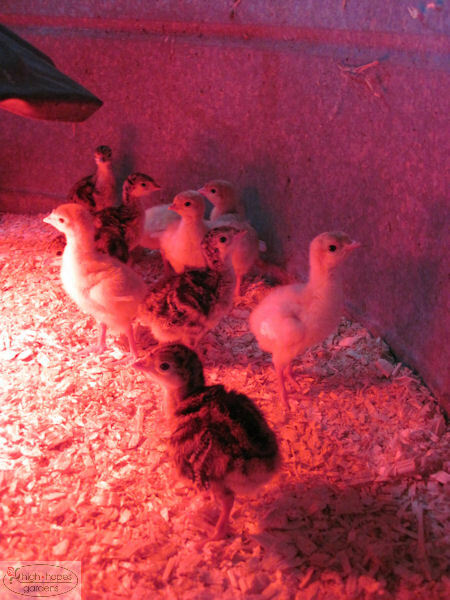 July 20, 2010 – Turkeys Arrive! The farm is quite a circle of life and death. Tank, our favorite ewe passes last week and 20 baby turkeys (poults) arrive this week. The good news is it’s so blimey hot that brooding is fairly simple this time of year. It’s hard to believe that by Thanksgiving these will be 16-22 lbs dressed out! The biggest bummer of vacation was finding out our best ewe died while we were gone. From a photo this winter, Tank is the brown one in the foreground. Evidently, they went into the shed where the 12 foot fishing boat was stored and somehow (I blame the horse) the boat was pushed off the trailer and Tank was found half underneath the boat. We told the person watching the farm “If you have livestock, you’ve got deadstock.” But still, finding a dead sheep the first time you came over to do chores is no doubt unnerving. We were way out of cell phone range, but between another neighbor and our remote outsourced farm support in India (Claire), the carcass got buried. 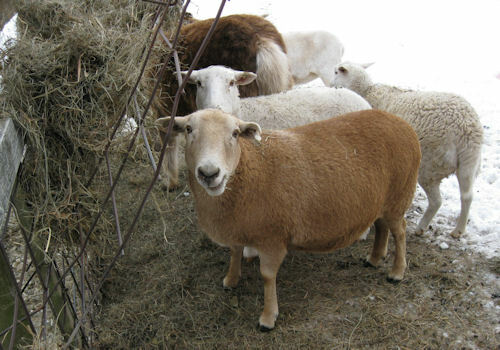 We are happy that Tank had triplets this spring, two of them ewes, so her genes run on at high hopes gardens. 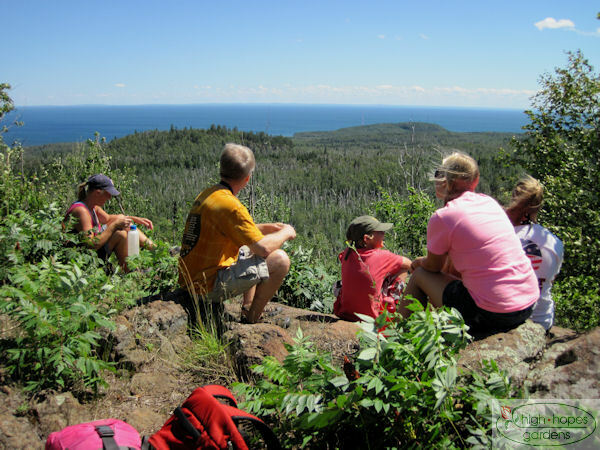 The final photos from the trip are from Tettegouche State Park. 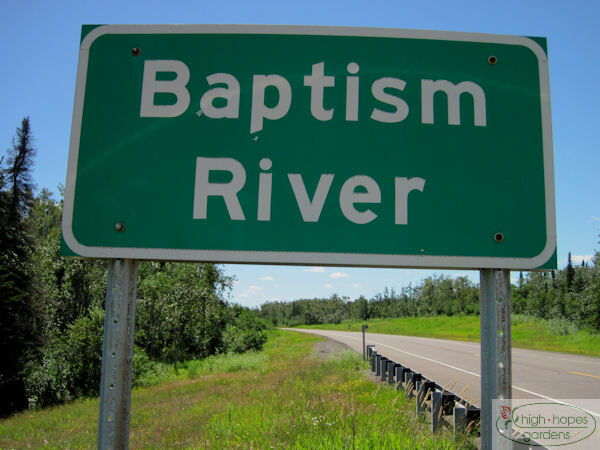 The primary feature of the park is the Baptism River and its journey to Lake Superior. 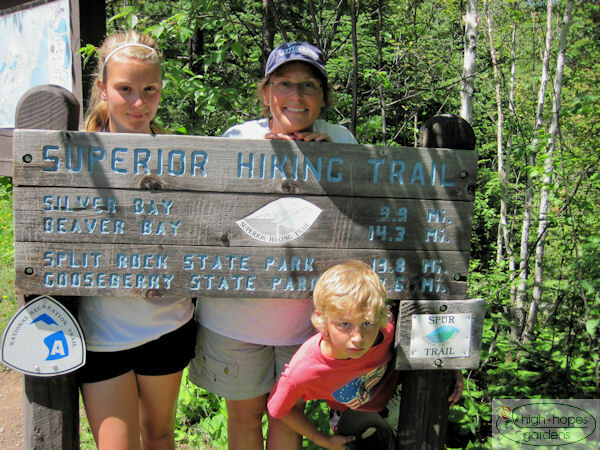 Part of the Superior Hiking Trail goes through the park. We took a slight detour and hiked up to this overlook along the trail. Martin was a good sport and enjoyed looking back at the lake and knowing he had hiked from the water’s edge up to this point. He put seven miles on his feet on this hike. 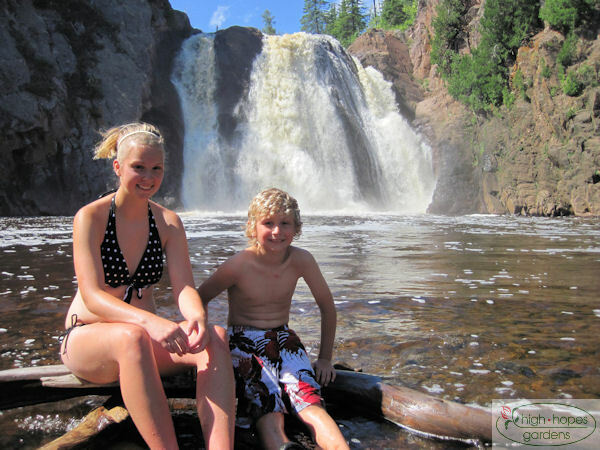 The reward is the high falls of the Baptism River. 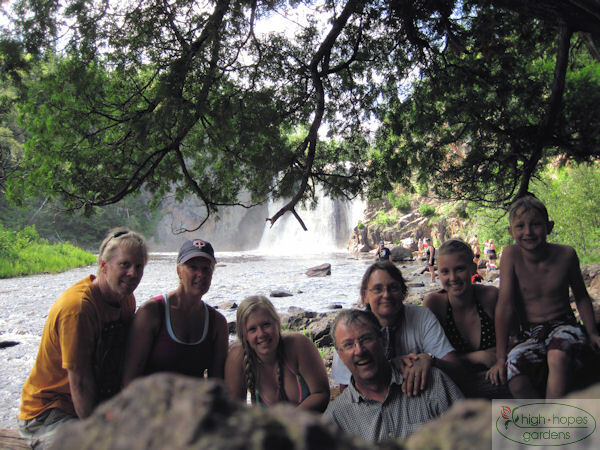 It is an enchanting place with a big pool below the cascading waterfalls. For July, the falls had a pretty good flow. 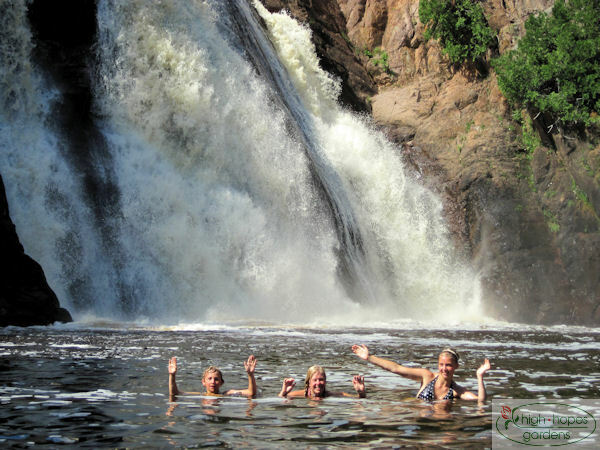 Swimming in the pool is a great thrill among the sound of the crashing water and the spray from the falls. As the week draws to a close, a group shot. Emma commented that this was the first time she really missed her sister!